Cleveland Browns receiver Odell Beckham Jr. considers his reunion with Jarvis Landry to be his biggest blessing. CLEVELAND — If Cleveland Browns wide receiver Odell Beckham Jr. was going to leave the New York Giants and go to another team, he had one goal: to reunite with his LSU teammate, multi-time Pro Bowl pass catcher Jarvis Landry. 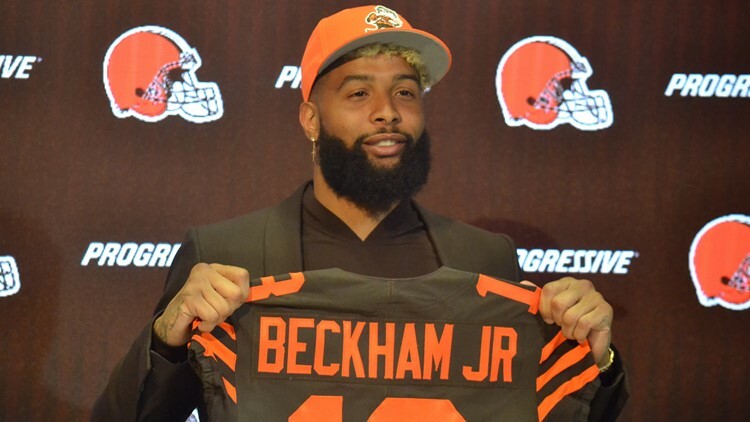 Well, one year after acquiring Landry from the Miami Dolphins, the Browns made that reunion happen when they sent safety Jabrill Peppers and a pair of picks in the 2019 NFL Draft to the Giants in exchange for Beckham Jr.
“This is my guy,” Beckham Jr. said of Landry. “This is everything I ever dreamed of and more. I am just really excited about the opportunity. I can’t lie. I am looking at it, I feel it and I think this is the biggest blessing, especially being able to be here for him. When the Browns acquired Beckham Jr., general manager John Dorsey expected the newest pass catcher would push Landry, who would respond in kind, not only in games, but every day in practice and meetings based on conversations with former LSU coach Les Miles. Miles was impressed by how Landry and Beckham Jr. would compete in practice, and even afterward, where they perfected the art of making one-handed catches, which has become a staple in their games. “This reason this all happened is because of him,” Beckham Jr. said. “We would sneak into the facility at midnight and shoot JUGS until 2 a.m. We would be like, ‘Let’s go outside and talk,’ and we would go throw right outside our room, throwing the football back and forth and playing 20 or 21. Landry and Beckham Jr. will be coached with the Browns by wide receivers coach Adam Henry, same man who mentored them at LSU. “Obviously, I think the thing that makes Adam so special -- we had are times together at LSU -- but he was a part of the recruiting process for me in high school and things like that, so he knows a lot about our lives inside and out,” Landry recalled. And that is music to the ears of quarterback Baker Mayfield, who is very much looking forward to throwing passes to both Landry and Beckham Jr. during the 2019 season.